Traditional approaches to prenatal genetic diagnosis for common presentations such as short femurs or intrauterine growth restriction are imperfect, and whole-exome sequencing is an emerging option. 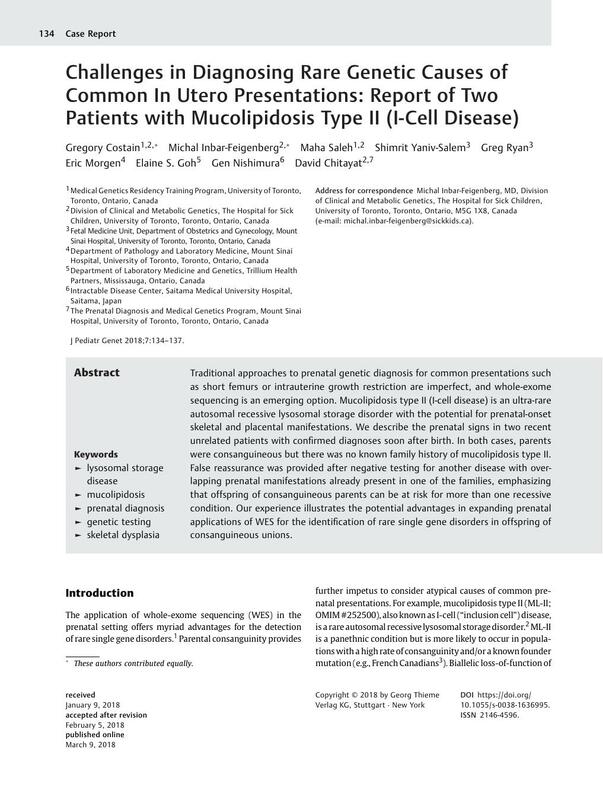 Mucolipidosis type II (I-cell disease) is an ultra-rare autosomal recessive lysosomal storage disorder with the potential for prenatal-onset skeletal and placental manifestations. We describe the prenatal signs in two recent unrelated patients with confirmed diagnoses soon after birth. In both cases, parents were consanguineous but there was no known family history of mucolipidosis type II. False reassurance was provided after negative testing for another disease with overlapping prenatal manifestations already present in one of the families, emphasizing that offspring of consanguineous parents can be at risk for more than one recessive condition. Our experience illustrates the potential advantages in expanding prenatal applications of WES for the identification of rare single gene disorders in offspring of consanguineous unions. Both families provided informed consent for inclusion in this report. Approval from a Research Ethics Board is not required at our institution for publication of a case series.